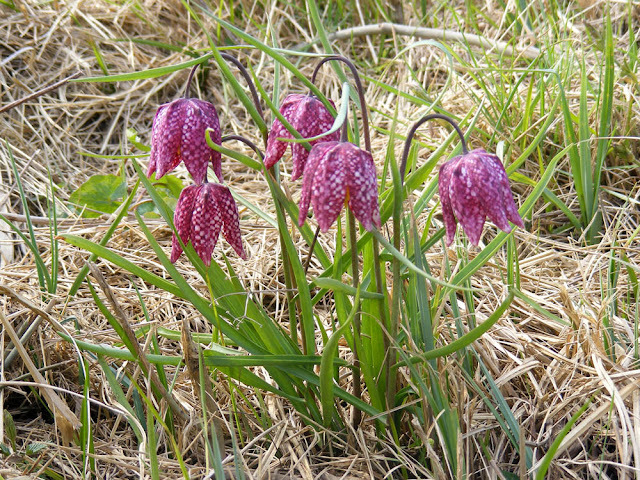 Snakeshead Fritillary Fritillaria meleagris is now very rare in the wild. Its stronghold is a small section of the Loire Valley, where the largest concentration of plants can be seen in the area known as the Véron, west of Chinon, in the triangle formed by the confluence of the Vienne and the Loire. They meet at a place called Candes Saint Martin, and the bridge there is a good starting point if you want to see the flowers. A small group in a ditch in the Aigronne Valley. In a good year there may be hundreds of thousands of flowers in some meadows. They need the damp grassland provided by traditional water meadow or bocage pasture, both increasingly rare habitats. Their flowering period is all too brief -- you only have from about mid March to mid April to see them in bloom. 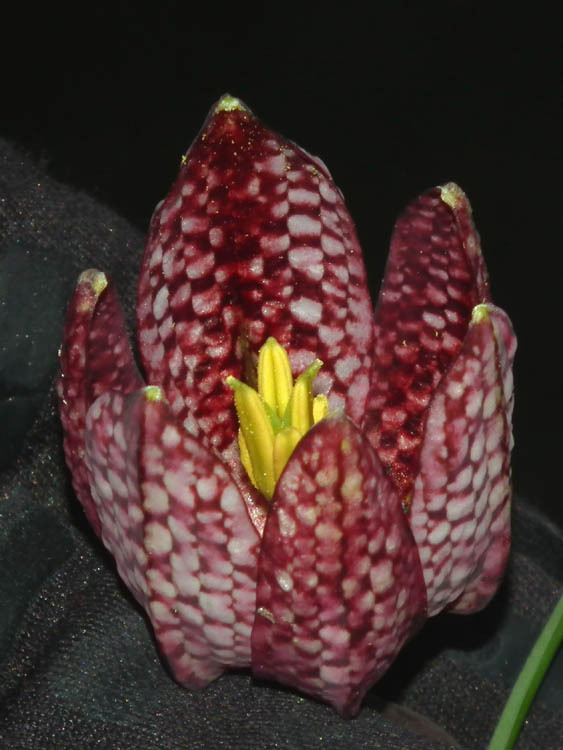 Close up of an individual flower. Two years ago we were lucky enough to see them at three separate locations -- la Giraudière, near Beaumont-en-Véron, in the bocage close to the Vienne; the island in the river Indre at Pont de Ruan; and along a roadside ditch by some water meadows on the Aigronne river between le Petit Pressigny and le Grand Pressigny. The wet winter of 2012-13 presumably benefitted them. Likewise, in 2014 they were prolific and appeared to have enjoyed all the rain over the winter. Snakeshead Fritillary habitat -- a ditch between the road and the water meadow in the Aigronne Valley. 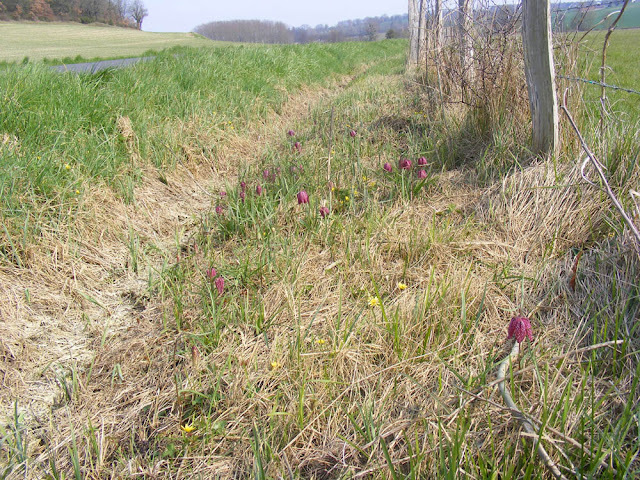 The local authority now practices fauchage tardive (late slashing) along the ditches and roadsides, which means the seeds get a chance to mature and germinate. They are surprisingly difficult to spot until you get your eye in. 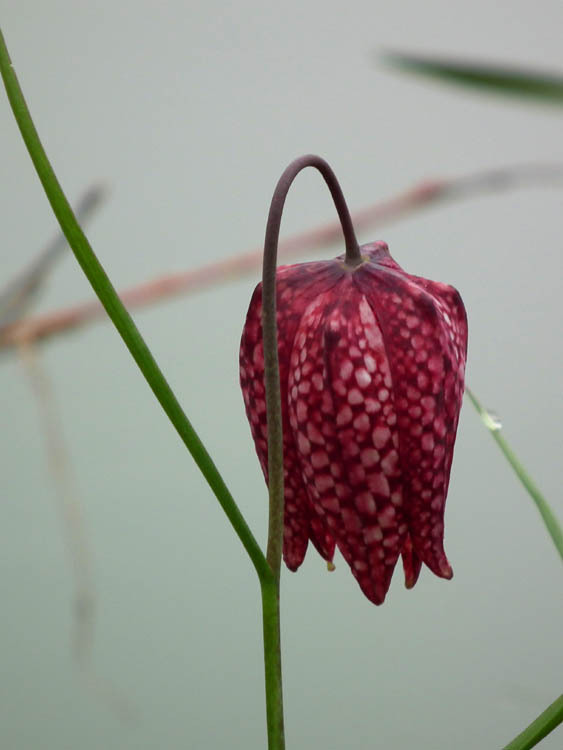 They are about the same height as the grass around them, and although the flowers are quite large, their mottled snakeskin pattern and browny purple coloration means they can blend in remarkably well. They apparently self seed easily and so seem to benefit from temporary bare patches and disturbed areas. Maintenance of the bocage hedges and ditches doesn't seem to be too much of a threat to them if it is done sensitively, although I am more dubious about wholescale poplar plantations and modern ditching machinery. I suspect the ones on the island at Pont de Ruan suffer a bit from compaction too, with people inevitably walking on the plants. The interior of the flower. On the island in the Indre at Pont de Ruan, with the water in the background. I haven't been to check on the ones along the Aigronne yet, so I don't know if they've started or not. No, I checked this morning! I'll keep an eye on them and do a quick post on Aigronne Wildlife when they start to appear. I never met one in person, so to speak. Wish I did. You can buy the bulbs so you could grow them in the garden. These remind me of what I know as lady slipper and jack-in-the-pulpit. Wonder if they're the same family. The plant I know as lady slipper is orchid family and jack-in-the-pulpit is one of the polite 19th century names for wild arum, which is lily family. Fritillaries are also lily family. 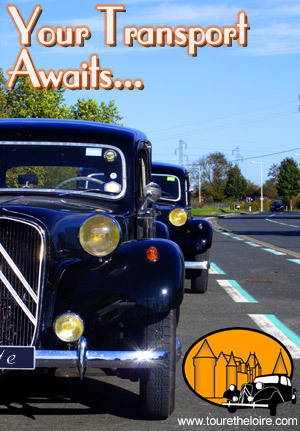 I used to go to see them in the area surrounding a lake in the Layon area....a real multitude every year. I planted them in the damp area in our garden and had quite a success, but since we left they have, apparently, disappeared. Avid pickers, I suspect. Lily beetles will do for them too. Charming. 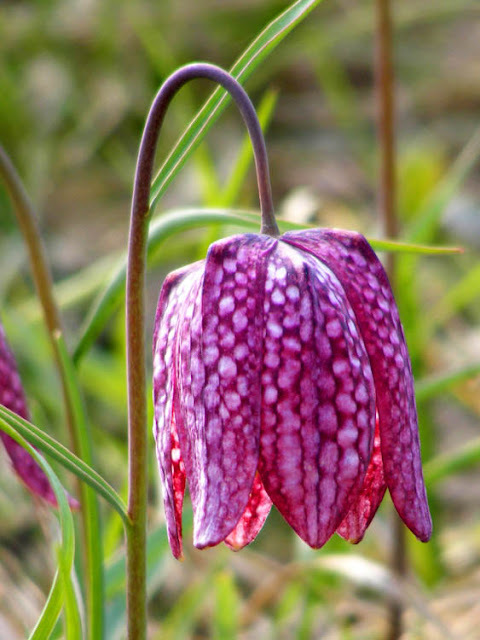 I have the perfect place for these little gems in our French garden, but unfortunately unseen pests and giant slugs manage to devour anything I plant at our maison secondaire once we leave for home (Australia). I guess the best approach under those circumstances is look at what your neighbours have in their gardens and plant that.